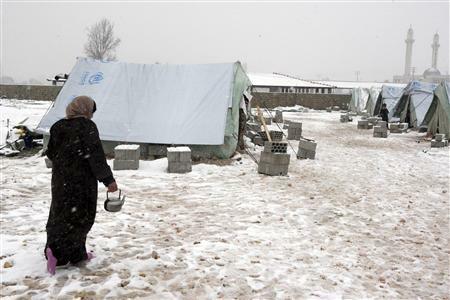 Refugees in Lebanon's Bekaa Valley are in dire need of assistance now that extreme winter cold has started claiming lives. The region has experienced the most violent winter storm in two decades, which brought heavy snow, high winds, rainfall and freezing temperatures. The cold has gotten so bad babies have died. One of the victims was reportedly a 2-month old baby from while another child aged 4 froze to death, according to a ministry director for refugees in Syria. Refugees are in desperate need of clothes, socks, and proper footwear, while children need baby formula and diapers. Christian Aid workers have started working on getting some of the basic needs delivered to those in need, including medical care, blankets and heaters. UK-based Christian Aid has sent emergency funds to help buy blankets and sheeting for 6,000 people living in temporary shelters in Gaza, as well as fuel and stoves for 4,600 refugees in Lebanon's Bekaa Valley. According to Euan Crawshaw, Christian Aid's Regional Emergency Manager for the Middle East, the situation is still dangerous for the displaced families especially since their current accommodation is in bad condition. "With the threat of further severe winter weather in the coming weeks, Christian Aid is delivering vital assistance through local partners on the ground in Gaza and Lebanon. We have worked as fast as possible to distribute blankets, plastic sheeting, stoves and fuel to more than ten thousand people," said Crawshaw. Proper footwear is another concern for refugees. One ministry director found children wearing sandals in the freezing temperatures. There's a need to buy at least 1,100 pairs of children's shoes and 800 pairs of adult shoes, 1,500 coats for children and babies, 500 coats for adults, and many pairs of socks.